Eyes wide open, the two IBM gentlemen look at me. They sit up right. Professional. Spot On. You can feel their enthusiasm, their expectations are high. Both are social collaboration leaders at IBM, evangelizing on the #newwaytowork. That’s how the software technology company hashtags their latest journey to the revolution of the email as they call the launch of their new inbox communication software “IBM Verse”. You can tell how excited the two managers in front of me are to talk about the IBM success story. The launch seemed to have gone well so far. On my opening question both face each other, not sure who shall answer. They are professionals in communication, they are prepared. “The term Verse is historic for communication and conversation”, replies Dr. Peter Schuett, Leader Social Business Strategy at IBM. “In times of Goethe, when carriers brought people hand-written letters, all the communication that went to and fro was written in verse.” The answer surprised me as IBM’s development sounds like a trip in the past. It is not. For the first time, IBM has taken a new development approach. They made their customers think about the new software solution by inviting customer to their labs, by rethinking email, and by thinking design and customer experience first, based on real customer feedback, input and inspiration. Not the cheapest way to innovate. The product development cost 100 Mio. US Dollars according to them. It has got to be effective from a customer perspective. For a long time, IBM has been a forerunner in terms of modern workplace technology. Their “Outside the Inbox” evangelist Luis Suarez has already been preaching for a business world with less emails. We all know the reasons why he was addressing this. People get approximately 127 emails a day. This means emails kills 28% of our daily work-time, and thus of our daily productivity. With IBM Verse the software technology company wants to shift productivity. Creating a more effective business culture is the aim. From Ed Brill’s perspective, he is IBM’s social business transformation specialist, email should function as a transmitter. Email today should be serving notes like a private letter what Goethe used to do in hand-written form: delivering private information. “Email is the service forever. But it needs to be a personal service.” Dr. Peter Schuett, IBM. Focussing on the new software solution, I brought up the question in which way this is a revolution to email communication. Ed Brill emphasizes that IBM did not want to reinvent the email. IBM wished for a better email. However, IBM wanted to create a new intersection of email, calendar, social media and analytics. That’s what they have done with IBM Verse. When I showed a bit of my disappointment around the new solution’s capabilities in terms of being an aggregation platform for direct messaging and functionality as an inbox management system in general, Ed Brill rearranges my expectations in bringing the metaphor on suits which might all look different in design but are in a sense all alike from the amount of innovation in style and structure. And by the way, the power users of enterprise email are still personal assistants. True, sometimes people forget where they stand in the evolution of modern communication. With their “People” and “Analytics” functionality, the modern way of a more personalized communication approach seems to get in that social direction in the future. At least, when we compare IBM Verse and Facebook from a superficial point of view. With IBM Verse people also move into the centre of the communication universe which is meant to map the efficiency form content to people. IBM Verse “People” learns to show the users dynamically who is important to their communication, by hour, meeting and topic of conversation. Obviously, users can also change that and arrange it according to their premises. The world of communication gets filtered more and more. IBM Verse is definitely a big evolution step in email communication. Still, they could have made it a bit more of a revolution in delivering a multi-messaging and communication management platform in my eyes which integrates direct communication via Facebook, Twitter and others. Brill agrees that when CEOs wanted to spread the word around some company, product or people changes in the company, IBM was about to use email for that communication. Today, via IBM Connections -the internal use of their own company community platform- gets 7 Mio. accesses a month, and the CEO messages will reach (and achieve more feedback) more people via internal social messaging than via email in the past. Nevertheless, the two gentlemen did not want to commit to a statement whether IBM Verse and IBM Connections might become one platform in the future. But the approach to one collaborative workplace platform, serves the option to have fewer apps in the future. But hey, there is hope: “Rome was not build in one day!” summarizes Schuett in the quick Snapshot video interview in the end of our interview, and smiles. The questions we usually get from marketers are quite similar: What makes a good blog post? When is the best time to publish? How do questions in headlines perform? And so on. A recent report by TrackMaven analyzed 1.16 million posts from 4,618 blogs and 1.9 million social shares of those blog posts. The results were published in their Colossal Content Marketing Report. The analyzed content included blog posts from various publishers, like content marketers, individual bloggers, and media companies. The report shows that Tuesday and Wednesday performed as the most popular days for publishing posts. Of the analyzed blog posts 87% were published during Monday and Friday (9 AM to 6 PM ET with a peak at 11 AM-12 PM). This does not say though that weekends don`t perform well. 13% of blog posts published on weekends got more social shares per post on average. Although just 6.3% of posts were published on Saturdays, these still received 18% of the total social shares. As most marketers strive for engagement to justify their social business activities, one of the findings will be of best interest for them. The most social shares from blog posts came in the evenings around 9 PM-midnight ET (highest engagement 10-11 PM). Special peaks also occur when people get their coffee, meeting hours go down and after midnight TV shows (4-6 AM ET, 7-8 PM plus 1-2 AM). – Blog post titles of around 60 characters in length performed with most social shares (average was around 40 characters in length). – Blog posts with question marks in their title had almost twice as many social shares that those without any punctuation. – Blog posts with a mixture of capital and lowercase letters achieved most shares. – Blog posts get most sharings via Twitter (Tweets shares got 38.6% of total social shares) and Facebook (Facebook shares 26.7% – Likes got 33.8% of engagement). The headline definitely is a key element for blog posts being read and getting shares as on Twitter and Facebook there is not much more to see, and many people won’t even read but still share it the blog post. Although the magic headline might sound like a perfect tactic for blogging, there is more in blogging tactics than knowing when to publish or some rules around punctuation. Good content, relevant aspects, various point of views (interviews) and probably one of the main elements: continuity. Most blogs starts euphoric and die after some weeks. Blogging is a time-consuming challenge but with the right blogging tactics it is not rocket-science. In 2010, I started pinning down my main message to companies and their C-level managers in one quote. Thereafter, different quotes evolved which I collected in the vision area of the “About” page. The value of such a quote is for some managers marginal and for others massive when using it to explain the transformation of the business into a digital community-centric company or brand. Take it for what it is, and for what it’s worth for you, or let’s discuss it. Just before you start asking… By “business freestlye”, I address all departments in your company (like marketing, sales, customer service, HR, or other) that are responsible for planning, using, handling, and organizing the business tactics and strategy around the brand, product line or service offering of business relevance. Some facts that might be interesting for each one of those..
Social Networks – Which are growing fastest? PS: If you do it right, your workforce will freak out like the guy in this post. Believe me…! The aim of the Facebook Edgerank is to detect the updates people are most likely to engage with. One of the reasons why we sometimes don’t see our friends but those who are sharing updates that other people might like a bit more than others. In the end, the only answer that we see is the quality of posts. They might be short or long, with or without audio-video content, and also might have a picture, or not. Not the type of post makes the difference. It’s the understanding of your audience, and there social media monitoring is the key to all social business strategy as these will lead to your success. PostRocket just recently published a detailed infographic on the Edgerank topic. It is nicely explaining how this algorithm drives your Facebook marketing. 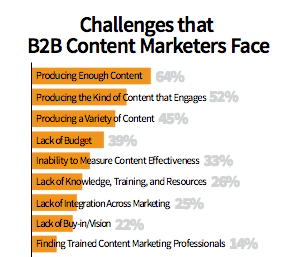 Study: Content Marketing – a challenge? B2B hiding behind false excuses…? We had written about a Curata content marketing survey some months ago. Now, I came across another research which is making it’s way through the web, and I am glad as I have been asked at a University St. Gallen event for some new insights on the topic today. The Content Marketing Institute’s 2013 benchmarks shows what the challenges for marketers are: producing enough content (64%), producing the kind of content that engages an audience (52%), or producing a variety of content (45%). Sounds like we have heard that before, right…? If you think lack of budget is still the issue, you might find yourself being in the wrong corner. Just 39% of the respondents said that they lack budget. Furthermore, traditional restrictions and limits like buy-in/vision (22%) or finding trained content marketers (14%) is falling out; not even senior level buy-in is their biggest challenge (7%). All lies? Well, seems like that… And when just 14% say, they are having problems hiring in this field, i would suggest some clever journalists or PR managers have found a way to market themselves. So, a questions arises that also came up today in my moderation: What is the real issue, why marketers don’t challenge the content marketing business? Are you really hiding in the content marketing fields, marketers – or is it a real challenge…? https://thestrategyweb.com/wp-content/uploads/2017/11/strategywebLogo-300x139.png 0 0 The Strategy Web https://thestrategyweb.com/wp-content/uploads/2017/11/strategywebLogo-300x139.png The Strategy Web2013-04-12 01:29:212013-04-12 01:29:21Study: Content Marketing - a challenge? B2B hiding behind false excuses...? Some weeks ago, we have written about the importance to be fast on response time on Social Media platforms. We made clear, based on some research by Convince & Convert, that companies need to react in not more than 60 seconds on complaints, customer enquiries and questions that appear on company’s and brands’ social platforms. Now, a recent study of some of the biggest brands in the U.S., like Coca-Cola, McDonalds, Visa or Starbucks shows that providing a top standard of customer support on Twitter is not really as fantastic as it seems. Although some readings of all those good posts about these brands and their Social Media efforts might assume the companies do whatever they can in Social Business terms. In the study, four Software Advice employees used their personal Twitter accounts to address customer service tweets to 14 consumer brands in seven industries – McDonalds, Starbucks (Fast Food), Coca Cola, Pepsi (Soft Drinks), Visa, Mastercard (Credit Cards), Wells Fargo, Bank Of America (Banking), Walmart, Home Depot (Retail), Apple*, HP (Consumer Tech), Gillette and Colgate (Personal Care). Many companies and brands are asking themselves (and us): “How fast do we have to give some feedback or answer when somebody is pinging us on Facebook, Twitter and the likes?” Or: Do we have to give some feedback on the weekends? And the answers we have heard were quite astonishing. Many managers in companies still think they have got a day or two to reply to their customers – whether they are speaking with them on email or on one of their realtime streams. Many test we have done so far, have shown us that most companies don’t react at all, some not on weekends, and some after one or two days. Be sure, if you offer your clients a realtime channel, they will use it – and they don’t care if the problem comes up on a weekend or not. In a recent research by Convince and Convert we can find some clean answer now: 42% of the respondents expect an answer in the first 60 minutes! What comes even worse for companies: 57% want the some reaction time no matter what time of day it is or whether it is a Saturday or Sunday. In total, 67% expect some response by companies in the someday. Still, many companies don’t have the right resources to satisfy their customers Social Media expectations. And there are many reasons for it: not enough resources, lack in modern process management or lack in technical establishment. Some companies started mentioning their opening hours in the info or biography fields which kind of makes sense and becomes a state-of-the-art workaround for the interim period until companies understand what a full-fledged social business with proper community management means. And this definitely goes away from the “9-to-5” workplace we know from our fathers. The main challenge for companies and brands is to find out what the deeper demand of the status update, the comment, the review or a rating is. Remember the 3R’s? In the end, what we have learned years ago, is that people want to have the feeling someone is taking care of them immediately. This does not essentially say that companies or brands have to supply the best possible answer or solution. Many managers have still not understood the fine difference between these topics. The technology service provider Appirio published some findings that most business people are more social personally than they are at work. The findings show that twice as many managers are engaged in Social Media compared to the people they have in their teams. What the survey did not tell us is the reason why the people are using social platforms and features less than their managers. Are they not allowed to engage on communities at work? Are Social Media policies too much black and white? Or do they not see the benefits Social Media offers? The positive outcome is that there is some understanding of culture and ownership of the social business as the driving factors for success. Although marketing seems to be owning the social business transformation, the question remains if this does not make space for a new position in companies like chief web officer or chief culture officer. Another question that could be raised in companies in my eyes.